There was a tragic crime committed here in SLC last night. A man held a gun on a clerk at a gas station located as part of a major grocery store chain. 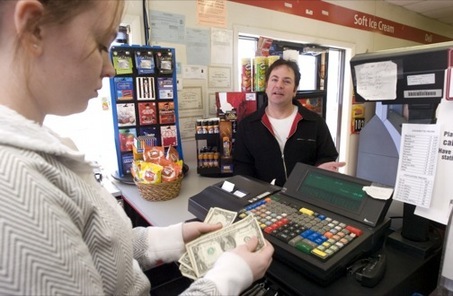 The clerk was in the windowed area that you typically see in the gas stations nowadays. The gunman demanded cash which the clerk did not have. As a result the gunman demanded that he go into the main portion of the store and get him cash. (This guy clearly is not operating with a full deck.) After the clerk left (and called 9-1-1 from the main store) a woman pulled up to fill her car with gas. The gunman approached her and demanded her money which she informed him she did not have. The gunman then ordered her into her car to drive him to an ATM machine. She complied and after giving the gunman money he then ordered her to get back into the car and drive to a cul de sac where he sexually assaulted her. He then required her to drive a few more blocks away and then got out of the car and instructed her to drive in the opposite direction. There simply aren’t any words to describe how heinous and shocking this crime is, however, it causes me to write about it in hopes that women will read this and learn how they should handle a similar prospect. A couple of ground rules here first of all –it’s very, very important that when you have a gun pulled on you like this, regardless of how many movies you’ve seen, you need to remind yourself that the gun is a tool of control in the hands of most criminals—not a murder weapon. Don’t fixate on the gun. 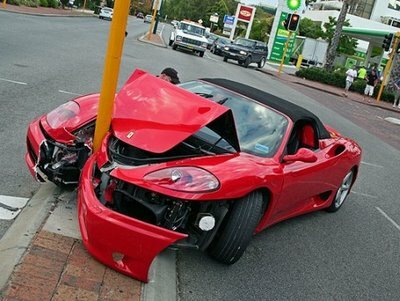 Next, there should never be a situation in which you fail to be aware of your surroundings. As you pull up to the gas station, always select the most lighted and well seen area—even if it means you have to wait in line to get your fuel. When you get out of the car, look around at your surroundings. Never face the gas dispensing machine directly, always at an angle. And if it has a reflective cover on it, keep an eye out in that reflection for what may be happening behind you. As you are filling your car with fuel, use the reflection of your windows to help assess your surroundings. 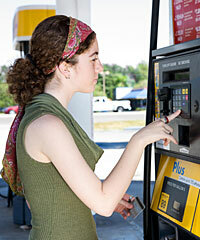 Don’t allow yourself to be fixated on the numbers running on the dispenser, the gas nozzle etc. Be aware of what’s going on around you. You can use the reflection in the windows of your car to help you with that as well as constantly moving your head around to see. Now, on to some actions that I hope each woman reading this will remember. If you are approached while filling your tank, understand that the gas nozzle is a weapon. Pull it while spraying fuel at your would-be assailant and RUN behind shelter immediately. Even trained police officers miss 70% of their firearm shots, so even IF the perpetrator is intent on shooting you for non-compliance it’s very likely he will miss even when only 6 or 7 feet away from you. Remember, no matter which end of the gun you are, there will be climatic emotions. Even well-seasoned criminals rarely practice shooting moving targets—and they certainly aren’t able to do so in a manner which will mimic the adrenaline high that they’ve got running through their body. This surge of emotion slows the physical responses as all of the blood is diverted from their brain to other parts of their body for fight or flight. So unless you’re dealing with an expertly trained marksman, moving quickly to shelter is a viable solution. Even better is if you’ve got the opportunity to move to their weak side of their body. (That would be the opposite side of their body which is hold the firearm. If they are holding the firearm with both hands, then they are likely to have one foot more forward of another. That foot forward will indicate which side is their non-dominant side. O.K. So let’s say escaping at the gas pump isn’t possible for some reason or another—and let’s say that I’m your typical female who is not packing heat. In which case I can guarantee you that I would have tried to throw my keys and my wallet far away from the perpetrator and then run as described previously. Which reminds me, carrying a firearm may not be realistic for you. If that’s the case then you should always view your cell phone as a necessary “weapon”—meaning that when you get in or out of the car, it’s with you so that you will always be able to call for help after you’ve run. 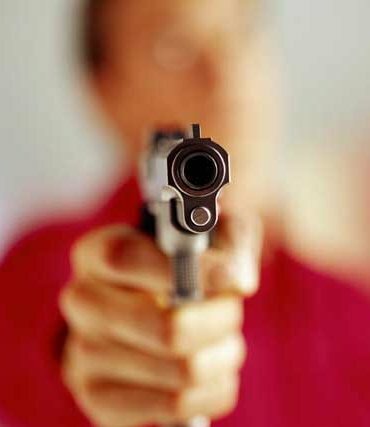 Moving on… Now let’s look at a situation in which he’s in the car, gun pointed at you, and telling you to drive somewhere specific. Put your seatbelt on, drive towards where he’s telling you, and then step on it, Mama, and run into something, preferably targeting the passenger’s side of the front car. As you’re speeding up, he can’t shoot you because you’re driving. The moment you start to aggressively speed up that gun is going to move because he will have a natural physical reaction. It is VERY unlikely that he will have put his seatbelt on. Most criminals aren’t going to buckle in for a nice leisurely ride to the bank. They will be on the edge of their seat with a minimal amount of balance. If he’s in the seat directly behind you, this is still a viable strategy and once you have selected your ramming target, get your right hand on the seat belt and be prepared to release it and evacuate the car. Yes, you’ll be in some pain regardless of how great your airbags are, but I assure you that victorious pain heals a lot better than victimized pain. Now, let’s look at another scenario, one in which you’re armed. To be honest, it’s very unlikely that this would have happened to me simply as a result of preventative measures. But also, if the guy comes at me from the back of my vehicle, I suspect he’d notice the Women of Caliber car sign that takes up my entire back window. I’m positive this has been a deterrent in the past as I’ve traveled at all hours all across the nation. But enough about me—let’s talk about you. If you are carrying your firearm, I’d still go for the gas pump spray and run first if there is enough distance between you. But if not, I’d pull my firearm with my weak side pointed towards him in order to ensure the element of surprise, and then fire. This action means that two fundamentals need to be in place; 1) that you have practiced shooting across your body like that, and 2) that you have the mental fortitude to pull your firearm when necessary. Just so you don’t feel defeated in reading this advice, keep in mind that this is ideal. Dog gone it, if you have to pull your firearm and shoot it in some other way that’s comfortable to you, then do it and don’t worry about the physical angle. It’s simply offered as a strategic suggestion and one in which I’m comfortable with after practicing it for years. 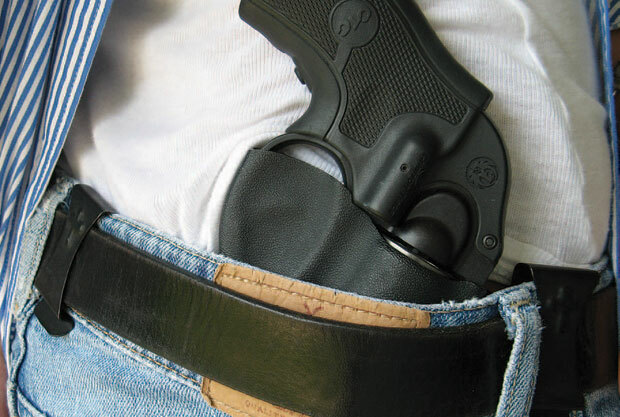 In spite of many women taking to carrying firearms nowadays– like never before in history—I find that the majority of them still are not carrying them on their person for whatever reasons. Instead they are in their purses. I have a firearm in my purse as well. As such, I have literally practiced a specific response repeatedly in which I feign a frightened and frenzy response to a would-be criminal in an attempt to get my “money” out of my purse, only to be able to grab the trigger of my firearm, point the purse at him, and shoot through the purse towards the perpetrator. 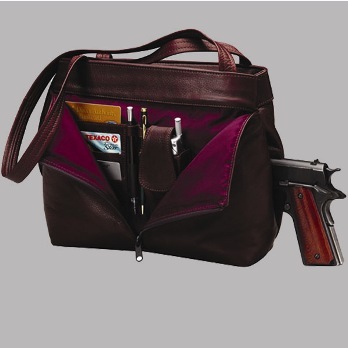 If you are unable to shoot through your purse (easier done with a revolver rather than a semi-auto, depending on the type of purse you carry) then you should definitely be practicing a quick-draw movement of your firearm from the purse. In case you weren’t aware, getting into the car with a criminal is one of the worst things you can do and it should be your number one priority to avoid. Use the panic button on your remote control. (Yes, this means stop leaving your keys in the car when you’re filling it up.) Lay on the horn, etc. The most important key to escaping the same fate as the woman in this story is to mentally prepare yourself for it and the actions you intend to take. Copyright Protected 2011, Women of Caliber and Kellene Bishop. All Rights Reserved. No portion of any content on this site may be duplicated, transferred, copied, or published without written permission from the author. However, you are welcome to provide a link to the content on your site or in your written works.